Flow rate up to 1,060 gph maximum per unit. Step-wise transition from mechianical filtration to high-efficiency bio filtration. Matala Expandable gravity filter maximizes Matala® filter media performance. The rugged Biosteps 10 contains an amazing 200 sq. ft. of surface area for beneficial bacteria growth. you get unparalleled mechanical and biological filtration for superior water quality. 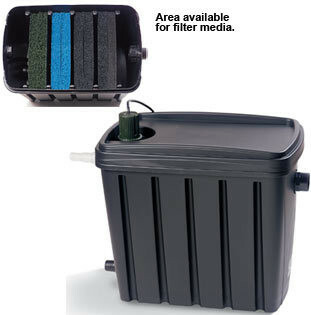 or use Biosteps 10 with optional UV Clarifier for improved water clarity. Supplied with sufficient volume of Matala® filtermedia with progressive densities. Flow rate up to 1060 gph maximum per unit.